Draft Daily: What do we make of Davis Webb's inconsistency? The PFF Draft Daily will hit on a number of NFL Draft-related topics including recent news, scouting reports, PFF draft takes and much more on a daily basis. The draft rumors are circulating around Cal QB Davis Webb, whose name has been thrown around as a late-first- or early-second-round possibility. The Texas Tech transfer got off to a great start last season as his PFF grade ranked fourth in the nation through five weeks, but he ranked dead last (142nd) from Week 6 through the end of the season. His dropoff did coincide with a thumb injury suffered in his Week 6 game against Oregon State, but even if he played through the injury, the dropoff is concerning. While Webb can make special throws, whether dropping them in with touch or driving the ball downfield when under pressure, his throw-for-throw accuracy is a concern and he complements the big throws with far too many turnover-worthy plays. 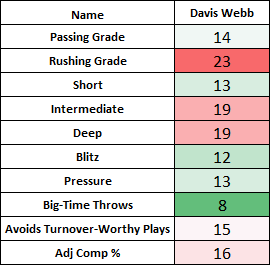 See the below chart, which includes Webb’s rank in each category. Caleb Brantley: Small sample but a sign of huge production? There were 330 interior defensive linemen who played more snaps than Florida’s Caleb Brantley in 2016, but Brantley is one of the most intriguing penetrators in the draft. In his three years, he’s played only 1,103 snaps, including a career-high 434 snaps in 2015. During his time on the field, he’s been ultra-productive, picking up seven sacks, 16 QB hits, and 41 hurries on his 569 rushes to go with 54 run-stops. His run-stop percentage of 11.3 percent tied for 12th in the nation last season, 11.2 run-stop percentage ranked seventh in 2015, and his 9.6 run-stop percentage ranked 10th in 2014. Last year, our small-sample darling on the interior defensive line was Chris Jones of Mississippi State, who played 1,052 snaps in 2014-15 with incredible production, and he was the top-graded rookie interior defensive lineman last season at 83.5. There’s rarely a dull moment with Mahomes under center, as he has the arm and playmaking ability to make special plays but that same aggressiveness also gets him into trouble as he puts the ball in harm’s way more than you’d like to see. It’s going to be all about harnessing Mahomes while allowing him to keep his natural playmaking ability at the next level. Here’s a sample look at Mahomes’ full profile from PFF Draft Pass. Check out our latest PFF Draft Podcast as I team with fellow senior analyst Mike Renner to break down combine winners and discuss my latest mock draft. Mike gives his usual hot take, overcommits to his “first-round locks” and we team up to create yet another scouting term to add to your vocabulary. Be sure to download and subscribe to the PFF Draft Podcast from your favorite provider. Be sure to check out our draft board and surf through the player profiles. Draft Pass subscribers not only have access to a downloadable PDF of our profiles and unique stats, but they can get all the same goodies right on the profile page on the site. Cornerbacks and safeties are dominating our initial top 100.